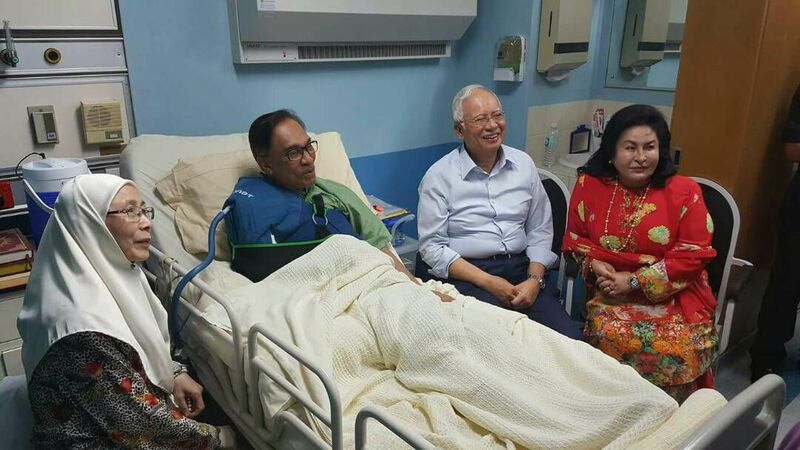 Kuala Lumpur: Prime Minister Datuk Seri Najib Tun Razak today visited Datuk Seri Anwar Ibrahim at the Kuala Lumpur Hospital (HKL). Najib shared a photo of him and his wife Datin Seri Rosmah Mansor visiting the opposition leader with the presence of his wife Datuk Seri Dr. Wan Azizah Wan Ismail. It was reported that Anwar had an operation on his right shoulder joint to heal his shoulder injury. According to his family, Anwar 70, had been suffering from continuous pain at the said area which became worse after he was involved in a road accident on 22 September. He was involved in the accident at Saujana Utama, Sungai Buloh en route to the Sungai Buloh prison after being hospitalised for four days at HKL.